Established in 2014, Dream Palace Casino has secured its position as a very popular online casino. Which is especially impressive when you consider what a terrible name the site has. It is clear what they were going for when deciding on Dream Palace as a name, advertise yourself as the place that dreams come true, if you build it, they will come. Which is lovely, and the aspiration and optimism is touching, but with such a ridiculous amount of competition on the online casino market, all the name really does is suggest an undeserved level of arrogance. But as the old saying goes, it’s not cocky if you can back up your boast, so what does Dream Palace Casino have to back up its claims? There is very little surprising about how this site looks, but that’s kind of what you want from a site with such a ham handed title. The logo is as you would expect, a neon sign bringing that sense of Vegas to the concept, again, far from unique but again, necessary considering the chosen theme. However, the neon colour schemes are kept to a minimum, and softened by a dark blue colour scheme through the majority of the background. There’s the obvious affluent skyline landscape floating behind the homepage as well. 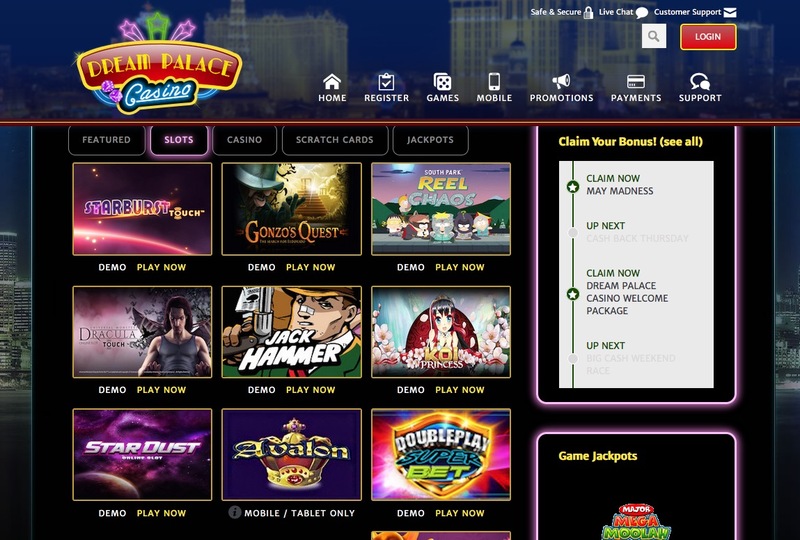 It has proven a popular choice in recent years for a selection of the most popular games to be available directly from the homepage, and that is what Dream Palace Casino does, with a good selection accessible straight off the bat. All other games, promotions, and important information is easy to find with the simple navigation across the site. The design theme here is every bit painting by numbers, but at the same time, opting for a predominantly dark colour scheme and keeping the bright, flashy design aspects to a minimum has resulting in one of the best executions of this overused concept that you are likely to find anywhere online. The sites that impress the most in terms of game selection are those that provide a wide choice of software providers, from the huge and well known, to the small and independent. This is exactly what you’ll get at Dream Palace Casino, with games available from Microgaming, NextGen Gaming, Thunderkick, Elk Studios, NetEnt and Quickfire to name but a small selection of what is on offer here. Slots fans will have a job even scrolling through all of the slots available here. If you are a fan of the old favourites, you have Foxin’ Wins, Thunderstruck (I and II), and Star Dust amongst others. If you have a taste for movie and TV themed slots, you’ll find a plethora, including Game of Thrones and Tomb Raider. If you’re after something new, the stunning new release 1429: Uncharted Seas is just one of those on offer. Blackjack, poker, and roulette in a huge array of variations, as well as other table and card games are on offer if you prefer that style of gameplay. Also, if you fancy a break and some instant win play during your day, then there’s a good selection of scratch cards on offer here too. The name may be off-putting, but the design makes up to that to a certain degree by being so well executed, and if you have any doubts left over, then all you need to do is scan through the smorgasbord of games on offer, and you’ll be a fan in no time!